The moment everyone has waited for is finally here. Seventeen years to the day, the New England Patriots will once again be taking on the Los Angeles Rams in Super Bowl 53, albeit with much different storylines this time around. The last time these two teams met in the Super Bowl, a young baby faced Tom Brady captured the hearts of a region. He stormed down the field in the waning seconds of the fourth quarter when many people, including John Madden, believed the second-year signal caller should have played it safe and gone into overtime. Similar to the AFC Championship in Kansas City, Brady stormed down the field to set up a game winning drive. The victory started the reign of supremacy that the Patriots have ruled over the NFL for the past two decades. It’s been a constant scenario that fans have been accustomed to seeing on a regular basis throughout Brady’s career. The big spotlight does not phase the 41-year-old, which gives the Patriots an advantage heading into this one. This contest is the opposite of sorts compared to the last meeting in 2001, as the young Bill Belichick and Brady squared off against The Greatest Show on Turf in Mike Martz and Kurt Warner. Now, the sides have turned. Young hotshot Rams head coach Sean McCoy has garnered a lot of attention with his ability to draw up effective gamelans and has had a tremendous influence on quarterback Jared Goff’s development in his third year. Goff has a nice supporting cast around him, but it will be interesting to see how he plays in the biggest stage in American sports. New England’s offensive line will undoubtedly have its hands full in this one. They have the difficult task of slowing down the two-time Defensive Player of the Year in Aaron Donald and a behemoth in Ndamukong Suh. Donald’s ability to cause disruption is second to none, and there is no denying Suh’s strength in the trenches. While the Patriots offensive line has done a good job up until this point, this will be their toughest task by far. Every Super Bowl the Patriots have lost has had one thing in common; the opposing defenses were able to pressure Brady and make him feel uncomfortable in the pocket. If the Rams want to give themselves a chance of winning this game, they will have to be frequent visitors in Brady’s line of sight. This game could very well be the last for tight end Rob Gronkowski. The eventual Hall of Famer has taken a beating during his nine-year career and it would not be shocking if he decides to hang it up no matter the outcome. While he did not look like his All-Pro self for the majority of this season, he did seem like a fragment of his old self against the Kansas City Chiefs in the AFC Championship. It also helps that he had an extra week off to rest. Whenever the Patriots are in a Super Bowl, it usually means that running back James White is going to have a big game. The former Wisconsin Badger has been a security blanket for Brady the past few years on dump offs in the flat as well as the screen game. If the Rams can get to Brady quick, expect him to look for White a lot out of the backfield. Meanwhile, rookie Sony Michel will also get his fair share of work in the ground game. Despite rushing 113 yards and two touchdowns, the Patriots did not use him during the overtime drive and elected to go with Rex Burkhead and White. The Rams will be sure to try and lock up Julian Edelman, who Brady deeply trusts in got-to-have-it situations. LA cornerbacks Aqib Talib and Marcus Peters are not matchup specific and stay on opposite sides of the field. Both are emotional players who can let it get the better of them at times. If the Patriots score early, expect tempers to flare. The key for the Rams’ offense will be for them to utilize their speed. Patriots cornerback Stephon Gilmore will more than likely line up against Robert Woods, while they will have the combination of speed corners Keion Crossen and Jonathan Jones line up with old friend Brandin Cooks. New England implemented a similar tactic against the Kansas City Chiefs during the AFC Championship game when covering Tyreek Hill. Cooks does not like to go over the middle and is more of a straight line receiver. His biggest threat is the ability to draw pass interference penalties due to his quick burst after the ball is snapped. Los Angeles will also look for the duo of CJ Anderson and Todd Gurley to carry the load in the backfield. Anderson has been the primary back in the playoffs thus far with Gurley’s inconsistent play as well as a nagging knee injury. It will be interesting to see what type of coverage the Patriots line up in. 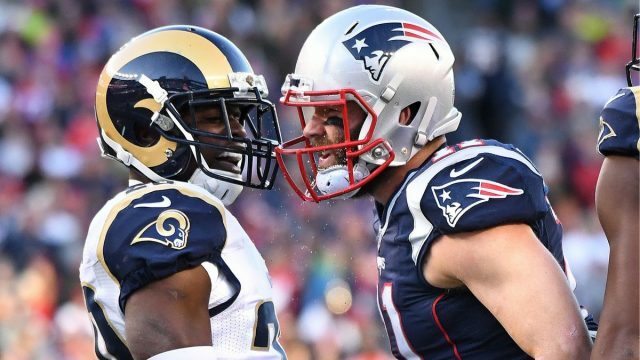 If they stick to their roots and play man-to-man, the Rams can run crossing routes and create a lot of separation with New England’s linebackers. If they go zone, communication will be key, especially in Gilmore’s case. The Patriots have been on this stage before and know what it takes to win in this chaotic environment. The team still has a sour taste in its mouths after last year’s heart-wrenching loss to the Philadelphia Eagles. We’ll find out in a few hours if this edition of the Patriots can avenge the loss.